Let Your Heart Melt with Eternal Love Slot! Let your heart melt and your account pack more wins this February when you spin our new Eternal Love slot with a 111% Match Bonus + 33 Free Love Spins! This exciting new slot machine is an “All Ways Pays” game with grouped Wilds that multiply for each Wild that appears in the win! Spin this feature to see the Life Force meter that hides a win value that is revealed after 10 Free Games. If the total win has not reached the Life Force value then the Extended Life Feature is triggered! Extra Free Games will continue until the “All Ways Feature” feature win reaches the Life Force value. The Life Force will continue to expand on each extra Free Game giving you more winning chances! 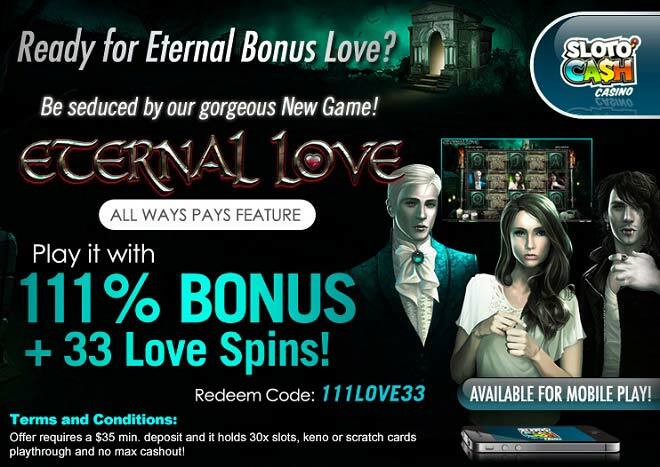 Prepare for a truly special month when you play our new Eternal Love slot with a 111% Match + 33 Free Spins!